Hello, this is my first tutorial, so I dont know where to start, I suppose a bit of background on its design would be a good place. For a while now, I have been aggravated by the crosshairs becoming impossible to see at higher resolutions. I wanted at least one (if not all) of them to be resolution independant, so I started off on making TriAPI based crosshairs. These got as far as spreadcircles, which look like crap, and take up too much space on the screen. I therefore decided to make a scope instead. I started off trying polygons, which made non-circular oddly shaped holes in the center of the screen (which looked nothing like the circular scope I wanted) and then moved on to using many triangles in a certain arrangement. I finally found the optimal one, which I would find hard to describe. Below is an image of my current (still somewhat buggy) version of the scope mask and crosshait system. NOTE: There is a health/armor display, and a flashlight battery display, and a ammo display, I just erased them with a graphics program becasue they arent what this is demonstrating. Now you're ready to start writing the actual code. (or copying it if you want it to crash if you set "cl_scoperes" above 360 or below 1, since I havent removed that bug yet, and have no intent of doing so on this tutorial) Most of it is pretty straight-forward, and is initialized like most TriAPI based things, except for the CVAR that controls the number of verticies in the "circlular" hole in the mask. So here's my initialization functions, might as well just give them to you, since you'd probably get them about right anyway. Take note that the default number for scoperes really doesnt do anything yet... that's because I didnt bother writing that code, and it seemed easier to do it this way. As I said, those are moronically simple, 4 lines each, and two are brackets. Now, the hardest part: Rendering!!! I'm going to let you c&p it, think of it as a gift. 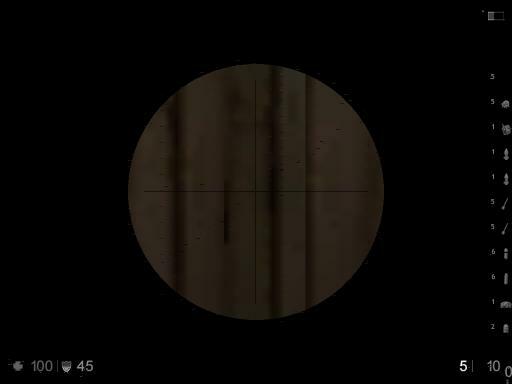 If you want actual crosshairs in this scope, that's your problem, just like interfacing it. I dont know what method you think is best. Personally, I recommend events, but you could use HUD messages if you wanted to. I'll tell you how to have it run, but not to make a toggling interface, that should be simple enough for you to figure out on your own. Now go write some interface code, and be gone with you. If you have any feedback (that isnt a question about the interfacing code) send it to the.unseen@comcast.net! I hope to hear some constructive feedback, and any spamming will be dealt with accordingly (deleted, and blocked.) If you have any complaints, SEND THEM ONLY ONCE. I dont like hearing the same complaint over and over. I give credit to Omega, for his orthogonal TriAPI tutorial, which I used as a base for this system. If anyone else has already wrote a tutorial like this one, I have no knowledge about it. I wrote this tutorial completely myself without any knowledge of a similar one. The default resolution isnt optomized yet. If I had done it right the first time and made it screen-resolution dependant, it would have been better. That picture has the hud erased, beacuse it's still in development stages, and currenty looks horrible. The real one looks fine. they don't look very erased to me. since i read it before it was approved, i've seen health/armor flashlight and a bunch of pickup icons on the picture. The old image had them erased, I forgot to erase the part that says they're erased when I replaced the image.